This beautiful vintage Hollywood crystal and pearl hair comb will adorn your hair with a flourish of floral femininity & classic vintage charm. Fans of vintage hair accessories from the 1940s/1950s Hollywood era will fall in love with the elegance of our Bygone Blooms Hair Comb. 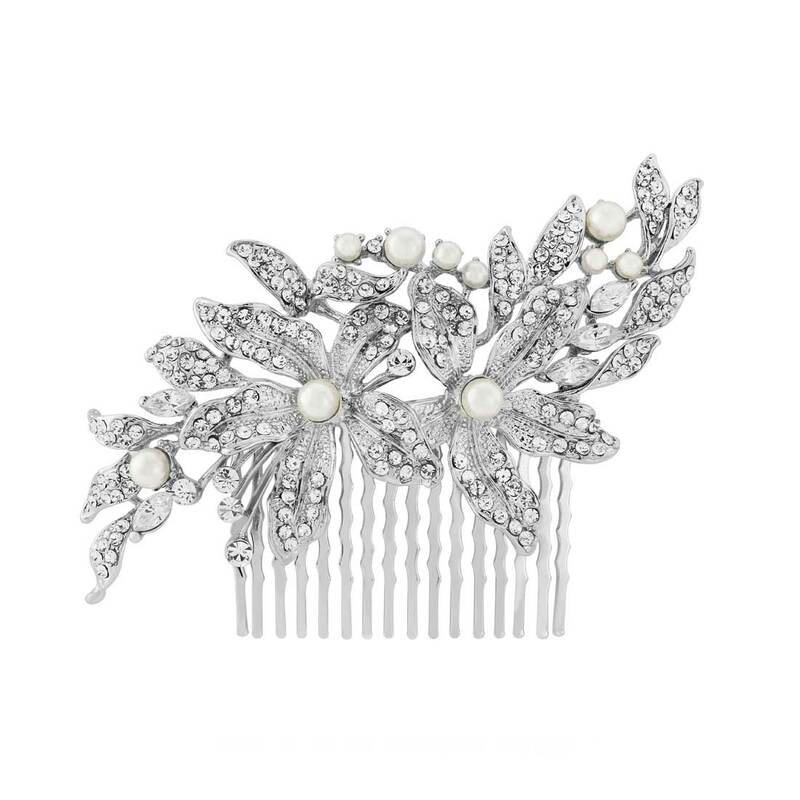 Featuring sparkling lillies and trailing leaves encrusted with clear Austrian crystals interspersed with glistening ivory faux pearls, this oversized silver tone hair comb beautifully captures the movie star glamour of the Silver Screen starlets. Suitable for both longer styles pinned at the sides or to sit amongst an elegant chignon or French pleat, this beautiful floral piece will add both romance and sophistication for an array of special occasions from a glitzy black tie ball to a summer prom. For statement style, team this sparkling comb with crystal and pearl earrings and bangle and be the "belle of the ball". 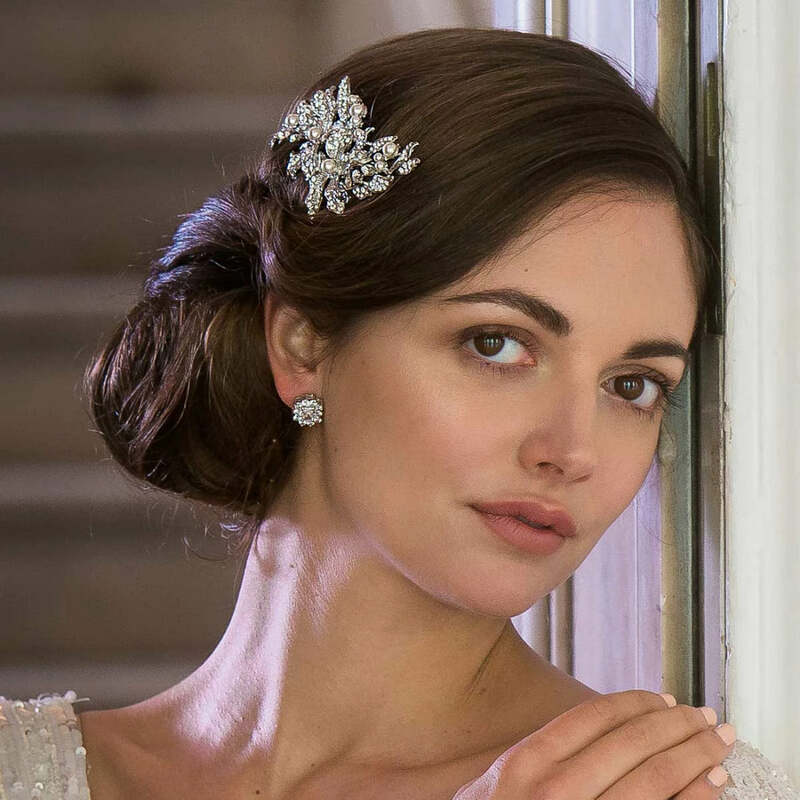 A delightful bridal accessory, Bygone Blooms is the perfect wedding piece for both brides and bridesmaids. Chic and glamorous, this charming sparkler could be teamed with a vintage inspired dress featuring floral enhancements for a summer wedding or would look equally in place alongside a snug fur wrap for a winter celebration.